Rev. John I. Jenkins, C.S.C., president of the University of Notre Dame, joined other national leaders of higher education calling for reforms in United States immigration policies on Friday (April 19), the National Immigration Forum Campus Day of Action for Immigration Reform. The University of Notre Dame and NBC Sports have reached agreement on a new 10-year contract giving NBC the rights to televise Irish home football games from 2016 to 2025 and extending the partnership between the University and network to 35 years. A joint announcement of the extension was made April 18 by Mark Lazarus, chairman of NBC Sports Group, and Notre Dame’s president, Rev. John I. Jenkins, C.S.C. Rev. Theodore M. Hesburgh, C.S.C., president emeritus of the University of Notre Dame, will be recognized as an Honorary Navy Chaplain in a special ceremony at 5:45 p.m. April 17 (Wednesday) in the William J. Carey Auditorium of the Hesburgh Library. The close connection between the University of Notre Dame and Ireland was proudly represented when the Fighting Irish played Navy on the football field in Dublin in September 2012. Notre Dame’s president, John I. Jenkins, C.S.C., and Enda Kenny, prime minister – or taoiseach – of Ireland, join together in encouraging Irish-Americans to carry on the spirit of collaboration to celebrate their Irish roots in a meaningful way. For the second year in a row, the University of Notre Dame is the No. 4 “dream college” among parents of college applicants, the Princeton Review reported in its annual “College Hopes and Worries” survey. Released Thursday (March 21), the rankings are, in order, Stanford University, Harvard College, Princeton University, Notre Dame, Massachusetts Institute of Technology, Yale University, New York University, Brown University, Columbia University and University of Michigan. The Princeton Review surveyed 9,955 prospective students and 4,170 parents for the results. Respondents from all 50 states as well as the District of Columbia and abroad filled out the 15-question survey. The Stayer Executive Education Center is open and ready for business. The Mendoza College of Business at the University of Notre Dame took the No. 1 spot for the fourth year in a row in the just-released Bloomberg Businessweek 2013 “Best Undergraduate Business Schools” ranking. Mendoza’s undergraduate studies ranked first in student satisfaction and fifth in employer satisfaction — the two main ranking criteria. The College also earned scores of “A+” for teaching quality, facilities and services, and job placement. The bells at the University of Notre Dame’s Basilica of the Sacred Heart rang in celebration this afternoon (March 13) as white smoke appeared from the chimney on the roof of the Sistine Chapel in Vatican City, signaling that a new pope had been chosen. Rev. 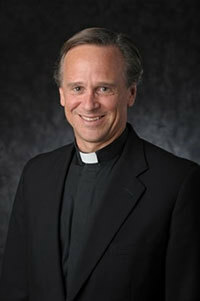 John I. Jenkins, C.S.C., Notre Dame’s president, offered his prayers for newly elected Pope Francis. 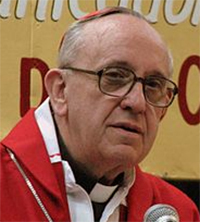 Cardinal Jorge Mario Bergoglio was elected by the College of Cardinals today in Rome as the 266th pontiff of the Catholic Church. The University of Notre Dame will join the Atlantic Coast Conference for athletic competition in all sports except football and hockey beginning with the upcoming 2013-14 seasons. Notre Dame has been a member of the Big East Conference in most sports since 1995. The University announced Sept. 13 it would leave the Big East to join the ACC. With the departure of the seven current non-football institutions — DePaul, Georgetown, Marquette, Providence, St. John’s, Seton Hall and Villanova — effective July 1, Notre Dame and the Big East jointly agreed that it would be best for Notre Dame to depart at the same time. Sister Susanne Gallagher, S.P. ; Sister Mary Therese Harrington, S.H. ; and Rev. 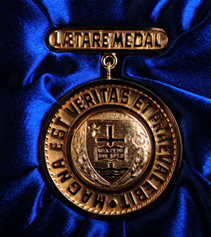 James H. McCarthy, founders of the Special Religious Education Development Network (SPRED), will receive the University of Notre Dame’s 2013 Laetare Medal, the oldest and most prestigious honor given to American Catholics, at Notre Dame’s 168th University Commencement ceremony May 19 (Sunday). 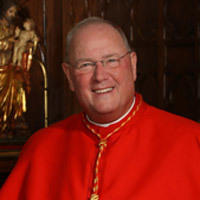 Cardinal Timothy Dolan, archbishop of New York and president of the U.S. Conference of Catholic Bishops, will be the principal speaker and the recipient of an honorary degree at the University of Notre Dame’s 168th Commencement Ceremony on May 19. 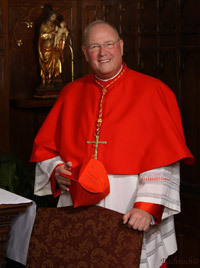 Cardinal Dolan was named archbishop of New York by Pope Benedict XVI on Feb. 23, 2009, after serving for the previous seven years as archbishop of Milwaukee. He was elected president of the U.S. Conference of Catholic Bishops on Nov. 16, 2010. 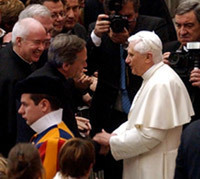 Pope Benedict elevated him to cardinal on Jan. 6, 2012. 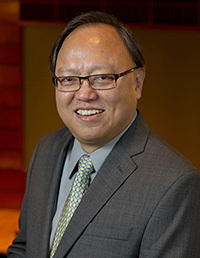 Roger Huang, interim dean of the Mendoza College of Business at the University of Notre Dame, has had the interim label removed from his title and is now the Martin J. Gillen Dean of the college, according to Rev. 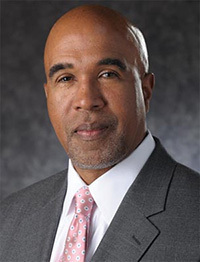 John I. Jenkins, C.S.C., president of the University. The Kenneth R. Meyer Professor of Global Investment Management at Notre Dame, Huang was appointed interim dean last year when Carolyn Woo became president and chief executive officer of Catholic Relief Services. Undergraduate tuition at the University of Notre Dame will increase 3.8 percent for the 2013-14 academic year to $44,605. The rate of increase matches that of the previous three years, which was the lowest since 1960. With average room and board rates of $12,512, total student charges will be $57,117. In a letter to parents and guardians of students returning for the next academic year, Notre Dame’s president, Rev. John I. Jenkins, C.S.C., thanked them for their investment in Notre Dame. Father Jenkins promised that the University would strive to honor their confidence and commitment by fully developing the already formidable gifts and talents the students bring to Notre Dame. Rev. John I. Jenkins, C.S.C., president of the University of Notre Dame, expressed his deep gratitude for the leadership of Pope Benedict XVI, who announced today (Feb. 11) his intention to step down from the papacy at the end of the month. Richard C. Notebaert, chair of the University of Notre Dame board of trustees, was elected to a new three-year term at the trustees’ meeting Feb. 1 (Friday). 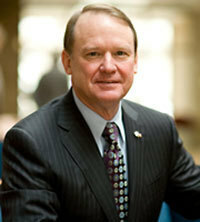 A member of the Notre Dame board of trustees since 1997, Notebaert became its sixth chairman in 2007. 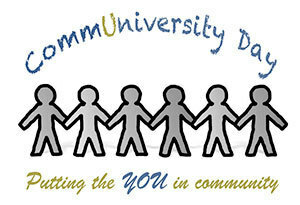 He is a Fellow of the University and previously served as chair of the board’s University Relations Committee. The following is a statement from Rev. 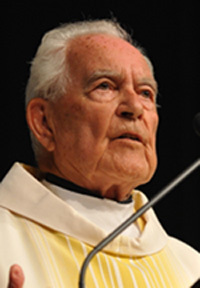 John I. Jenkins, C.S.C., president of the University of Notre Dame, on the Feb. 3, 2013, passing of Bishop John D’Arcy from the Diocese of Fort Wayne/South Bend.